Tech Brunch breaks down how complex technologies work. -- Ed. 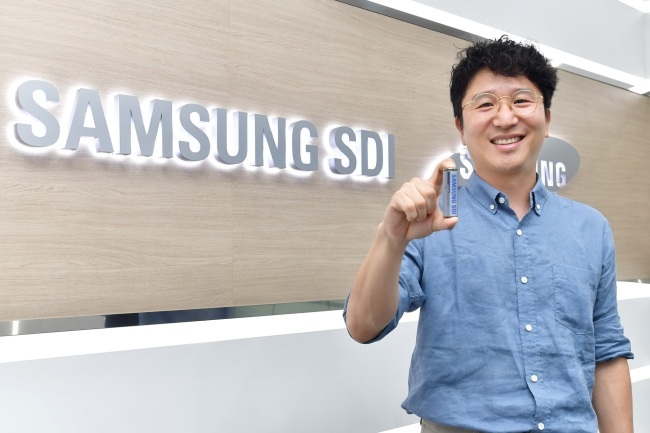 The second heyday of cylindrical batteries is coming as electronic applications get bigger while going wireless, and Samsung SDI is one of the firms leading the trend with the newest form factor of the cells, says Jeong Sang-hun, principal engineer at the company. “The latest 21700 cylindrical battery platform is on its way to becoming a new standard due to performance improvement and proven safety,” said Jeong in an interview with The Korea Herald on Thursday. Jeong, who has 12 years of expertise in the field of battery technology, led the development of the 21700 platform that started to be mass produced last year. With a diameter of 21 millimeters and a height of 70 mm, the cylinder-shape cell form is slightly bigger than the current market standard 18650 form -- 18 mm in diameter and 65 mm in height -- made by Sony about 20 years ago. The size was deemed ideal to fit into a handheld camcorder, the most popular device at the time. “Major customers are starting to adopt our platform, and we are seeing the range of applications expanding, from power tools, power banks, electronic cigarettes, energy storage systems, electronic bikes and forklifts to electric vehicles,” the developer said. Cylindrical batteries are mainly used for power tools like wireless drills that require high power, and Samsung SDI’s proprietary low-resistance design helps raise the power, Jeong explained. Along with the low-resistance design, high dexterity in handling the cell material -- nickel-cobalt-aluminum combination -- is part of the Samsung battery unit’s technological prowess. The cylindrical shape made of aluminum also serves as a shield for external shocks and prevents explosions, which is considered a strong competitive edge over pouch-type batteries. According to the industry, Samsung SDI was recently selected as a sole supplier of the 21700 cells by UK’s Jaguar for electric vehicles that are set for commercialization in 2020. Jaguar is only second to Tesla, which chose cylindrical batteries for its electric vehicles. While hand-held power tools need four to five cylindrical cells, 6,000 to 7,000 units are needed for an electric vehicle to run on the cells. “As Sony had been leading the market with the 18650 model for the past 20 years, we hope to see our new platform serve as the standard across industries for about the same period,” he said. 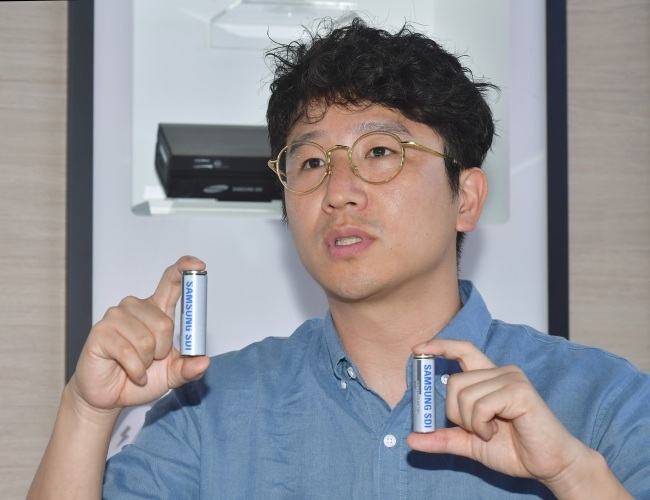 While anticipating the Samsung 21700 platform to take root in the electronics application market in the coming years, Jeong also foresees a new type of platform for cylindrical batteries in the longer term. “In response to changing market needs, a new platform could be developed with a focus on further raising the energy density in a single cell,” he forecast.